연곡사의 법당 남쪽에 서 있는 석탑으로, 3단의 기단(基壇) 위로 3층의 탑신(塔身)을 올린 모습이다. 기단의 각 층에는 4면의 모서리와 가운데에 기둥 모양을 본떠 새겨 두었다. 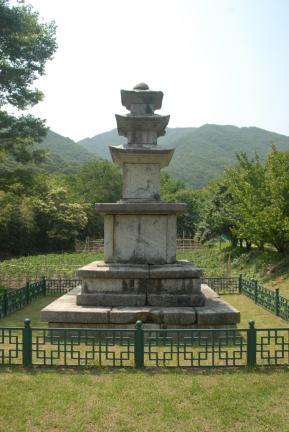 탑신은 몸돌과 지붕돌이 각각 하나의 돌로 되어 있으며, 각 층의 몸돌에도 모서리마다 기둥 모양을 본떠 새겼다. 지붕돌은 밑면의 받침이 각 층마다 4단이고 처마 밑은 수평이다. 또한 윗면에는 경쾌한 곡선이 흐르고, 네 귀퉁이에서의 치켜올림도 우아하다. 맨 윗기단이 매우 넓어졌으며, 이에 반하여 탑신부는 줄어든 느낌이 있지만, 맨 아래 기단부터 꼭대기에 이르기까지 체감비율도 온화하며 안정감이 느껴지는 아름다운 탑이다. 탑에 사용된 돌의 구성양식 등으로 미루어보아 건립연대는 통일신라 후기로 짐작된다. 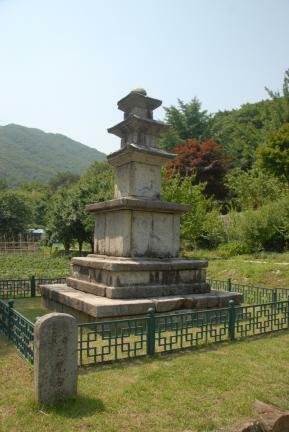 석탑의 3층 지붕돌은 밑으로 떨어져 있었는데 1967년 해체하여 수리할 때에 복원되었다. 이 때 윗층 기단 안에서 동조여래입상 1구가 발견되었다. 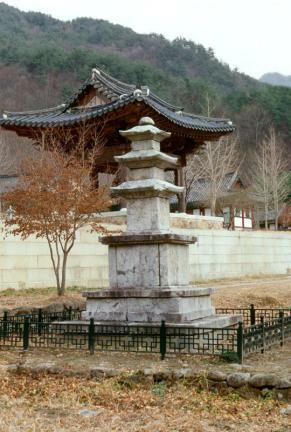 This stone pagoda, located just south of the Buddhist sanctuary at Yeongoksa Temple, consists of a three-story main body and a three-layer stylobate. 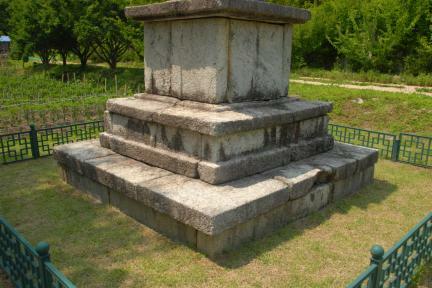 The four corners and the middle of each layer of the stylobate are engraved with pillar patterns. 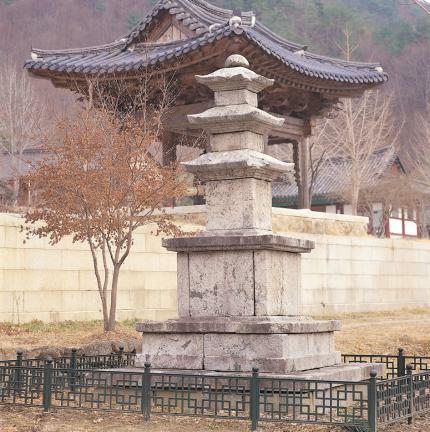 Each of the core stones of the main body and the roof stone is hewn from one stone. 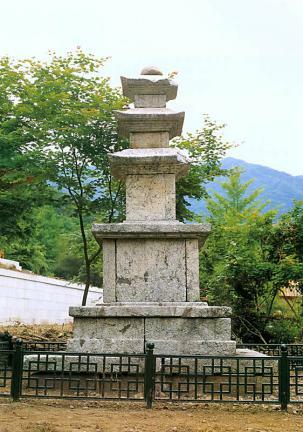 All the corners of the core stone of each story are also engraved with pillar patterns. 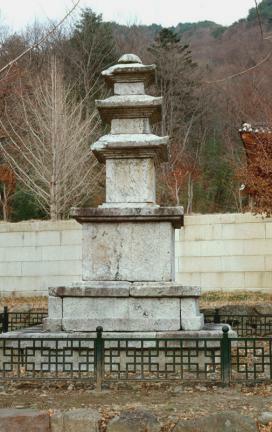 The roof stones have four-tiered cornices and the eaves are horizontal. The roof stone slopes gently, before turning swiftly upwards at the corners. As the top layer of the stylobate is very wide, the core stone of the main body looks relatively small. 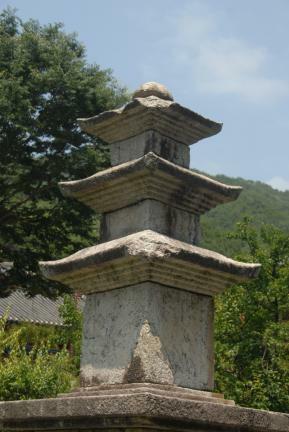 But the pagoda tapers in size from the bottom to the top smoothly, giving the pagoda a stable appearance. 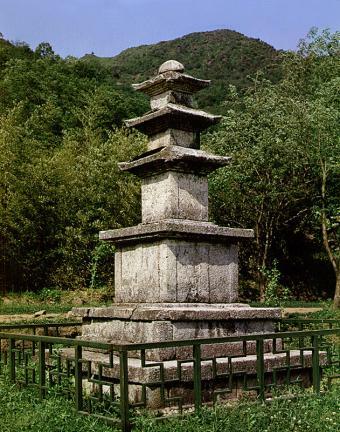 Judging from the stone structure of the pagoda, it is presumed to have been built during the late Unified Silla Period. During the restoration of the collapsed roof stone of the third story in 1967, a standing bronze Buddha was discovered inside the upper layer of the stylobate.